The Rococo style of art emerged in France in the early 18th century as a continuation of the Baroque style. In contrast to the heavier themes and darker colors of the Baroque, the Rococo style was characterized by an opulence, grace, playfulness, and lightness. Rococo motifs focused on the carefree aristocratic life and on lighthearted romance rather than heroic battles or religious figures; they also revolve heavily around nature and exterior settings. In the mid-late 18th century, Rococo was largely supplanted by the Neoclassic style. The word Rococo is seen as a combination of the French rocaille, or shell, and the Italian barocco, or Baroque style. Due to Rococo love of shell-like curves and focus on decorative arts, some critics used the term to derogatively imply that the style was frivolous or merely fashion; interestingly, when the term was first used in English in about 1836, it was a colloquialism meaning "old-fashioned". However, since the mid 19th century, the term has been accepted by art historians. While there is still some debate about the historical significance of the style to art in general, Rococo is now widely recognized as a major period in the development of European art. The sculptor Bouchardon represented Cupid engaged in carving his darts of love from the club of Hercules; this serves as an excellent symbol of the Rococo style—the demigod is transformed into the soft child, the bone-shattering club becomes the heart-scathing arrows, just as marble is so freely replaced by stucco. In this connection, the French sculptors, Robert Le Lorrain, Michel Clodion, and Pigalle may be mentioned in passing. Jean-Antoine Watteau (1684–1721) is generally considered the first great Rococo painter. He had a great influence on later painters, including François Boucher (1703–1770) and Jean-Honoré Fragonard (1732–1806), two masters of the late period. Even Thomas Gainsborough's (1727–1788) delicate touch and sensitivity are reflective of the Rococo spirit. Élisabeth-Louise Vigée-Le Brun's (1755-1842) style also shows a great deal of Rococo influence, particularly in her portraits of Marie Antoinette. 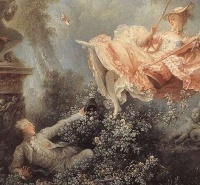 Other Rococo painters include: Jean François de Troy (1679-1752), Jean-Baptiste van Loo (1685-1745), his two sons Louis-Michel van Loo (1707–1771) and Charles-Amédée-Philippe van Loo (1719–1795), his younger brother Charles-André van Loo (1705–1765), Nicolas Lancret (1690-1743), and both Jean-Baptiste-Siméon Chardin (1699-1779) and Jean-Baptiste Greuze (1725-1805), who were important French painters of the Rococo era who are considered Anti-Rococo. During the Rococo era Portraiture was an important component of painting in all countries, but especially in England, where the leaders were William Hogarth (1697-1764), in a blunt realist style, and Francis Hayman (1708-1776), Angelica Kauffman who was Swiss, (1741-1807), Thomas Gainsborough and Joshua Reynolds (1723-1792), in more flattering styles influenced by Antony Van Dyck (1599-1641). While in France during the Rococo era Jean-Baptiste Greuze who was the favorite painter of Denis Diderot (1713-1785), Maurice Quentin de La Tour (1704-1788), and Élisabeth Vigée-Lebrun were highly accomplished Portrait painters and History painters. Unless indicated otherwise, the text in this article is either based on Wikipedia article "Rococo" or another language Wikipedia page thereof used under the terms of the GNU Free Documentation License; or on original research by Jahsonic and friends. See Art and Popular Culture's copyright notice. This page was last modified 12:25, 21 August 2010.